I freely admit it: I’m not really a recipe follower, except when it comes to baking. Even in baking, I prefer the sort of “template” recipe allowing for customization. 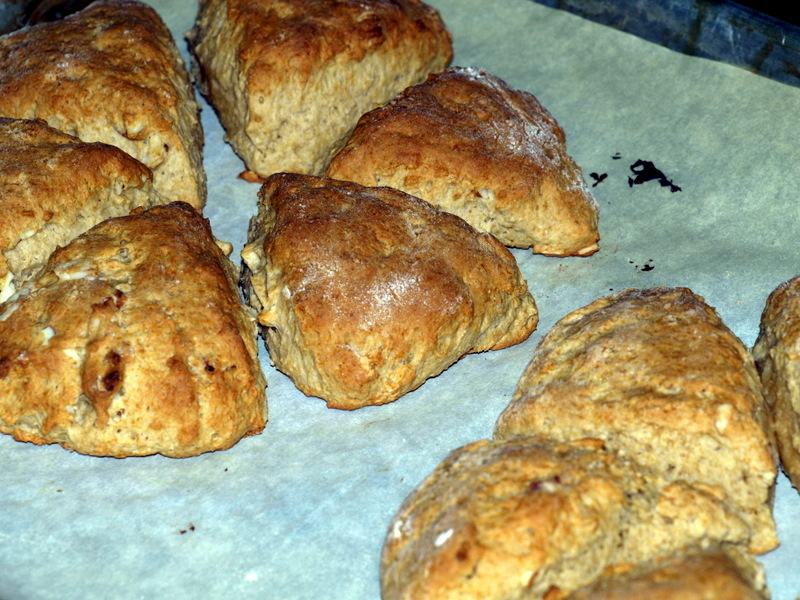 King Arthur’s basic scone recipe is a great example–it contains the key ingredients to create a scone and can accommodate almost any flavors and mix-ins. Here’s the recipe, featuring part whole wheat flour; it calls for a range, rather than specific amounts, of sugar, butter, and salt. Mixed in the food processor, the dough is soft and sticky, but it bakes up tender and light. (A few weeks ago, I used the food processor to make the best biscuits ever–super-high-rising, fluffly, and gorgeous.) I added sliced almonds and vanilla to the dough for a breakfast-friendly scone–though the flexible dough can handle most anything. Tell me about the biscuits. I’ve made scones in the Cuisinart, but never biscuits. I assume you do it the same way — whirl flour and leavening, pulse in butter (or what shortening do you use? ), add milk or buttermilk, spin just until it comes together. I still have some White Lilly flour and have used the recipe on the package, but they don’t come out stellar. I used cold Smith’s Creamery salted butter instead of shortening, cut into chunks then pulsed w/White Lily for a few whirls (in the same ratio as the fat:flour on the bag recipe). Added soured milk (whole milk w/a couple tsps white vinegar added), then continued to pulse until the dough came together on the blades. Didn’t bother w/kneading, rolling, or cutting–I just used a spring scoop to make drop biscuits. Baked at 500 degrees for 11-13 minutes. My drop biscuits are always better than my rolled/cut ones. Maybe that’s my problem. I always roll and cut. I’ll try that.